Businesses operate on data. That makes downtime of any of your databases unacceptable. Ensure you always have real-time access to all of your Oracle backup data. Meet business, long-term data sovereignty, and compliance requirements with Cohesity's fast, web-scale solution, certified by Oracle. Replace multiple data protection silos (e.g., target storage, media servers, master servers, and cloud gateways) with one solution for backup, recovery, replication, cloud tiering, archiving, and target storage. Manage backup attributes and reports through a single pane of glass. Simplify backup environments by eliminating the need for media servers and master servers. Use supported arrays such as Pure to backup Oracle in Cohesity. 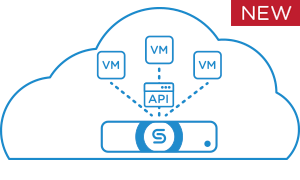 Use supported registered sources including virtual machines, physical servers, databases, storage arrays, and NAS appliances. Simply register a protection source by entering the hostname or IP address and the appropriate credentials. Enjoy multiple ways to backup your Oracle databases--all of which reduce RPOs and RTO while protecting your databases and making that backed up data readily available. Assess and validate your data protection strategy and requirements from both physical and logical perspectives. Leverage Cohesity’s unique support for the NFS protocol to instantly restore your Oracle database from images backup or copies residing on the Cohesity DataPlatform. Instantly switch the datafile to datafile copies residing on the Cohesity DataPlatform without having to copy or restore the datafile to another location. Present Oracle database backup files to any server in the environment with Cohesity’s unique ability to act as a NFS target. Automatically leverage Cohesity’s advanced algorithms global deduplication and compression for optimal storage efficiency as well as reducing secondary storage consumption and footprint. Continue to backup databases using existing scripts, resulting in minimal changes to your environment. 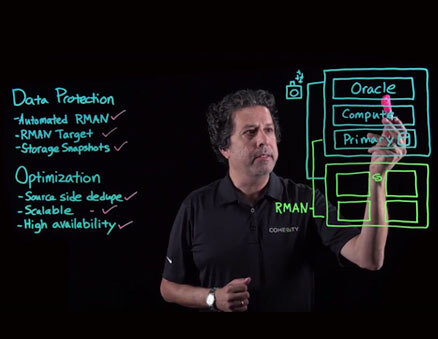 Let RMAN take care of all underlying database procedures before and after backup or restore. Know what Oracle blocks are available, increasing network availability because only a subset of blocks transfer. Allow more frequent backups in less time with Cohesity source side deduplication, certified by Oracle. Integrate with Amazon Cloud Services (AWS), Microsoft Azure, and Google Cloud for long-term archival and data tiering. Cohesity’s native Oracle Recovery Manager (RMAN) integration allowed the Credit Acceptance IT team to have a single backup and recovery solution throughout its environment. Looking for Web-Scale Performance for Data Protection and Recovery t of Your Oracle Database?